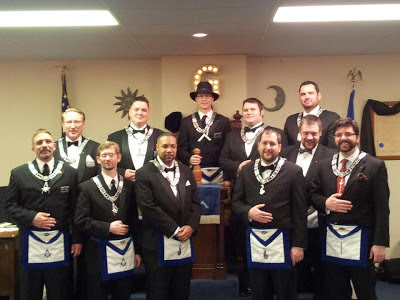 Discussion in 'Masonic Blogs' started by My Freemasonry, Jan 6, 2013. The officers of my mother lodge, Broad Ripple No. 643 in Indianapolis, were installed yesterday. Congratulations to Matt Scherer, Paul Lee Hargitt, Doug Eckhart, Jacob Mann, Neal Bennett, WM Ben Fuhr, Matthew Griffin, Derek Osgood, Matthew Davis, Tim Brinkmeyer and Michael August Walkup. A fine looking lineup, and remarkably young for a lodge these days. I'm proud of them all.